The conspiracy theorists looking for any reason to explain Karin's lower rankings every year will appreciate the idea that we're doing it just to screw with them, to be sure. It is always the most amusing part about skimming those threads. So glad for Maachan having a 3peat. Unless she graduates, I don't think she will lose her no.1 spot, so I hope Maachan don't graduate yet. Maachan is simply the best Idol in H!P. +10 Fukumura Mizuki  She's out of the top 10 Why is she not more popular still bugs me. +9 Sato Masaki  The best Idol right now and the future. +8 Ogata Haruna  She's will be higher next time, come on UFA push her this year. 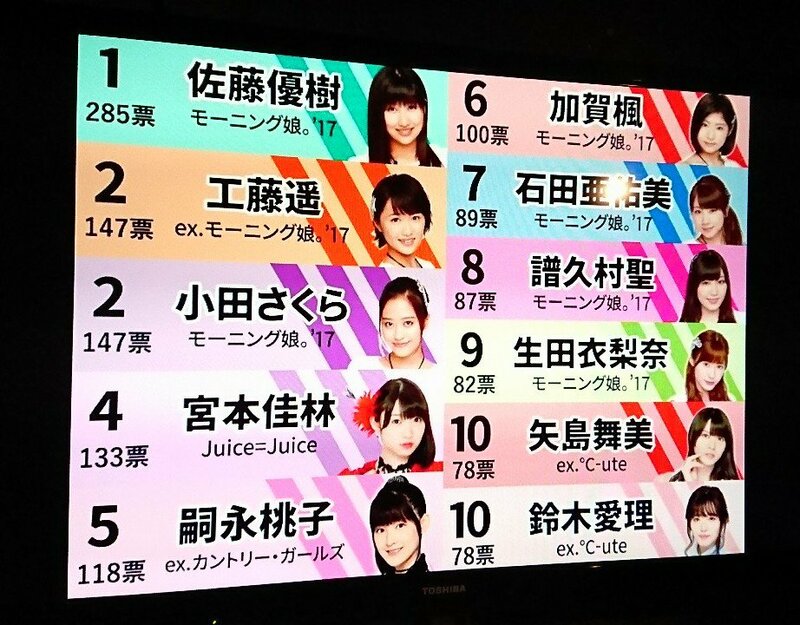 +7 Uemura Akari  I don't know why she's not higher, I thought she's at least 3rd most popular in JJ. +6 Kanazawa Tomoko  Good to know she's getting more votes even with the new JJ members joining. +5 Yokoyama Reina  Heck yeah, Yokoyan is the best new Idol in town, next time she'll be top 3. +4 Morito Chisaki  She even ranked higher ever since joining MM and she deserve it. +3 Yanagawa Nanami  Same as Morito, she's even more popular now, I think the bangs did the trick. +2 Inaba Manaka  Just happy that Manakan is back, she'll bounce back this year. +1 Onoda Saori  People need to look at Saori's charm more, she will do better this year, I hope. Best Idol Group - Morning Musume。'17  MM will always be the best H!P Idol group no matter what. Best Newcomer - Kawamura Ayano [I changed my vote to Yokoyama Reina]  Too bad she lost to Ruru but the gap is small so I'm still bitter she didn't win. Best Singer - Takagi Sayuki  Next year she's definitely be 2nd to Oda. Best Dancer - Inaba Manaka  I think this award should be automatically given to Manakan every year. She's clearly the best dancer even when Riho come's back. Idol you want to push - Ogata Haruna  I'm the first here to vote for her in this category and even campaigned on her thread to vote for her. So UFA please give Haachin the best push this year. I guess my taste kinda matches the general pop? Bit less MM-centric than the overall results though. 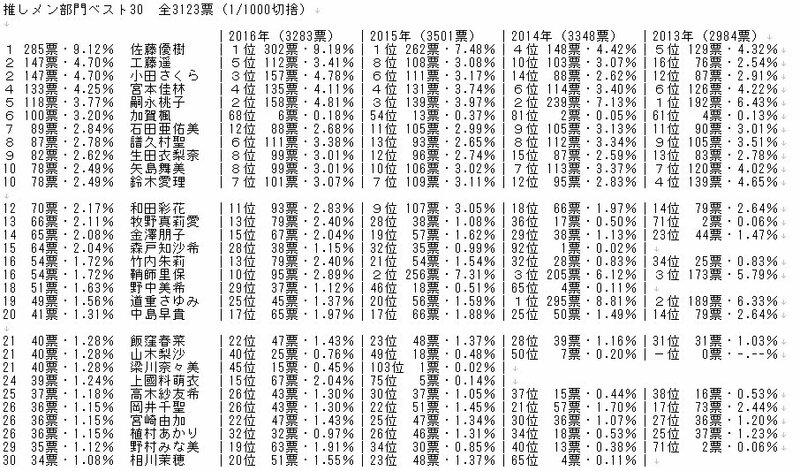 Glad to see Funaki, Yokoyan and Ruru ranking so high. Think next year they can all break the top 10. Is not in this forum, is the same in Japan. If you can't see it is cause you're blind, my dear. She's the [email protected] boss. I read a japanese comment saying: "°C-ute wota went to Juice=Juice and Tsubaki Factory"
having analyzed the votes, I can say that not really. In fact 2016 °C-ute group voters who voted this time stayed with °C-ute, thre rest went to Morning Musume, and just marginally to Juice=Juice and Tsubaki Factory. Juice=Juice and Tsubaki Factory's rise come from marginally gaining from all other groups. and also: "Kobushi Factory wotas went to Tsubaki Factory?" no, the votes went to all other groups. Thanks for all your hardwork guys! This election has been fun, eventho I did not participate, for my knowledge of other H!P members outside MM is scarcely limited as I'm just a newbie fan, and I didn't want to make a list that only has MM girls, it feels a bit unfair to others. Oh, my oshi wins! I'm sure if the Best Performer category wasn't removed, she'd have won it as well. Miki and Yoko's spots are fascinating! I think they did a great job in the year '17. My only wish for Miki is ditch her awkward expressions and fix her gestures in perfs, and vocal improvement for Yoko. I love these two. They'd be in my top 5 had I voted. Me too. Even with Sasshi's effect, I don't see that. I only see Maria, Ayumi and Chii-chan and Sakura be heavily featured in the media (and Duu in the past). ??? Maa-chan was featured on interviews a lot last year? Actually she might be the one that has always gotten interviews over the years. She isn't featured in any gravure shoots because she refuses to. You might have noticed that every current MM member at this point has a phonebook regardless of their popularity except Maa-chan. Now that I'm awake and alive again I want to thank the organizers of this poll again. I hope you'll continue to create these General Election for a long time to come! You guys are great! Thanks to minaeshi and keaine for all their hard work and congrats to all of the winners and participants! ​My idol rankings are all over the place lol, but I went mostly with my oshi's and legacy votes since I knew Maachan was going to run away with this even before the polling started. Glad to see that I did well on the categories. Manakan is a wall when it comes to dancing in H!P and her coming back sealed the deal. cant really complain, almost everyone in the top20! Thank for the hard job guys! Thank you guys for the hard work!! '14 . '15 . '16 . - there's a problem with the definition: what do you mean by "best performer"? Is it just the one who sings and dances the best? Then we already have categories for that. If you tell me that it's more complicated than that, then I'll say: "then isn't that category too vague?" - there isn't a lot of interest in this category; last year, the same people were topping the best performer vote and the best idol vote (the top 2 was the same and Oda Sakura had also a good rank in the best performer vote); so the only thing I learned is "people tend to think their best idol is the one who performs best"
2) I don't think many people are into pairing (e.g. I'm not, and I wouldn't vote for this category). - best Kenshuusei: I'm not against that but are there enough people interested enough in KSS to be able to choose someone in this category? I may have forgotten other submissions, remind me if so. Anyway, all other categories should stay for next year. Oh, and to answer another question: yes, we're going light on categories. Too much categories would completely dilute the meaning of each, I think. Like, the Japanese discussion mainly discusses the best idol and the best group vote, the best singer and dancer a bit, I've seen one post about the best newcomer vote and none for the "idol you want to push" (may be too complicated for Japanese to read, but I don't know). If we'd just add more categories, I think they'd be lost, and I think a lot of you would too. keaine: I would love a category for the Kenshuusei, but I say that as someone that pays quite a bit of attention to them. Among those in my votes for Best Idol, only one managed to crack the top 10. I'm happy Masaki came in at the top again, I love her. I know she never really needs extra votes but she may well end up on my list next year since °C-ute members no longer being included will leave me with at least one empty spot to fill. A nice trend formed within my category choices. All other eligible members didn't receive any +10 vote. Something I want to ask, after we have the results, why do some of the H!O members here say "not bad", etc, when comparing to the end results? Like is it suppose to be bad if you like different girls than what the majority likes? I don't get it lol. Anyways though, I like that only Eripon (besides Maachan) didn't move from her position on the ranking, just seems so Eripon like lol. So what are the Japanese wota saying about Nonaka Miki and her high ranking? I also wish to have a category for the KSS.